The Skinny: Die-hard Jackie Chan fans may be disappointed by their hero's minor appearance, but HK Cinemaphiles probably shouldn't miss this Lunar New Year comedy. 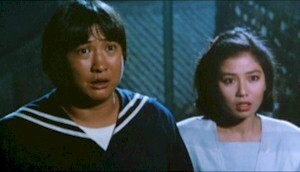 With the brilliant pairing of five Hong Kong actors and random Jackie Chan fighting in Winners and Sinners, Hong Kong Cinema birthed the transcendent filmmaking high-water mark known as Ng Fuk Sing, the “Five Lucky Stars.” A ragtag band of two-bit criminals, the Lucky Stars met in jail where they formed an invincible union dedicated to groping comely young women and engaging in embarrassing hijinks. Among them is the infamous comedy bit where master of comedy Richard Ng strips naked and walks around believing that he’s invisible. Meanwhile, the other lucky stars make comments about his privates and attempt to watch a soccer game. That they’re in the middle of a counterfeiting scam is unknown to them. Their simple existence of cleaning houses and lusting after Cherie Chung is enough to sustain them. Thankfully, the danger they face from the evil baddies is offset by the aid of Jackie Chan as a young cop who destroys property like no one’s business.